In July of 1518 in Strasbourg, France, a woman named Frau Troffea walked into the street and started to dance. She continued to dance on the street for several days, and by the end of the week 34 others had joined her. By the end of the month there were around 400 dancers in the streets. 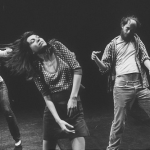 These people danced uncontrollably and in bizarre fashion. 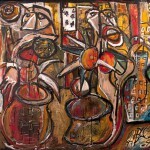 In addition, shouts, screams, and singing accompanied the hallucinations. Eventually, many would die from heart attack, stroke, or exhaustion. As the number of participating dancers grew, local officials started to worry. For some reason, physicians of the day encouraged more dancing, incorrectly assuming that the afflicted would only heal if they danced continuously night and day. Dance halls were constructed and musicians were paid to play music to keep the afflicted moving. This strategy backfired and if anything encouraged more people to dance. 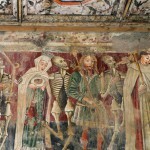 The Strasbourg incident in 1518 is by far the most well-known, although numerous other “outbreaks” – namely the 1374 outbreak in Aachen Germany – are very familiar to historians as the events were well recorded. Meanwhile, appeared several theories explaining what caused the dancing mania. According to one of them, it was poverty. The Mass Psychogenic Illness (MPI), a type of mass hysteria preceded by episodes of distress, was a cause due to high levels of poverty and famine at the time. However, another theory points to ergotism, which resulted from consuming ergot (a mold) on tainted bread. Besides, Consuming ergot has been known to cause seizures, delirium, and hallucinations. Although, it includes good properties, also known to restrict blood flow to the limbs, which would make it rather hard to dance. 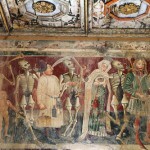 Still, others point to religion or superstition. 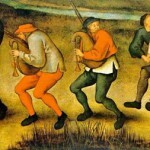 Saint Vitus’ dance was the term most often assigned to dancing manias of medieval times. 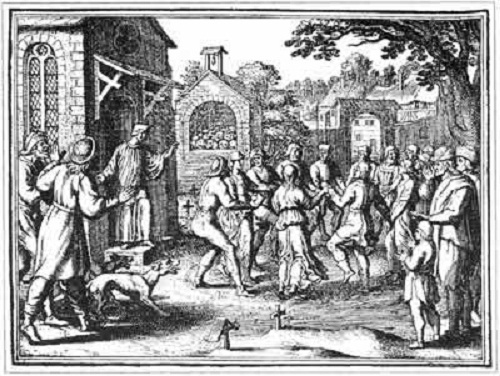 Catholic legend says invoking the wrath of Saint Vitus would provoke compulsive dancing. This might just be the most plausible explanation since the dancing plague appeared to die out as the super-naturalist beliefs that fed it gradually disappeared. 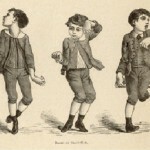 Also called Sydenham’s chorea, St. Vitus Dance occurs in children and makes them have twitchy, uncontrollable movements. By the way, girls – more often effected than boys. The ages to which this disease is from about 5-15. Most children will have a sore throat weeks before the symptoms begin. Related to rheumatic fever, this disease was treated by bed rest. Sydenham’s Chorea is more common in females than males and most patients are children, below 18 years of age. Adult onset of Sydenham’s Chorea is comparatively rare and most of the adult cases are associated with exacerbation of chorea following childhood Sydenham’s Chorea. 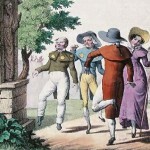 Whether the motions of the enthusiastic dancers resembled the symptoms of those suffering from any of the diseases known as chorea, or whether people who suffered from disorders of the nervous system were often miraculously cured at the shrine is not known for certain, but chorea is commonly referred to as ‘‘St. 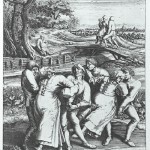 Vitus’s dance’’ for the violent motions that accompany the disease. 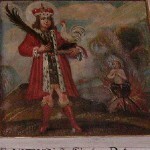 St. Vitus is the patron saint not only of those suffering from epilepsy and other disorders of the nervous system, but of actors and dancers as well. Saint Vitus was a Christian saint from Sicily. He died as a martyr during the persecution of Christians by co-ruling Roman Emperors Diocletian and Maximian in 303. 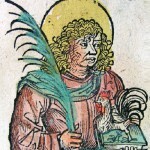 Vitus is counted as one of the Fourteen Holy Helpers of the Roman Catholic Church. 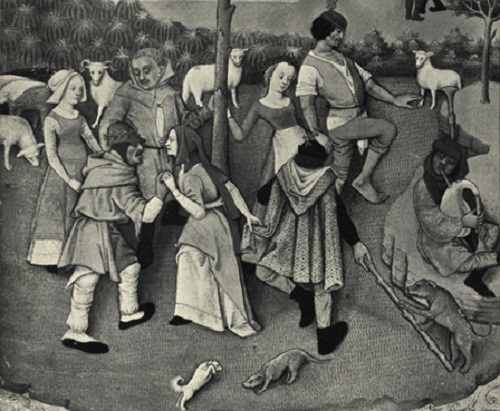 Vitus is considered the patron saint of actors, comedians, dancers, and epileptics. He is also said to protect against lightning strikes, animal attacks and oversleeping, and is the patron saint of Bohemia. There is no specific cure for such disease as Saint Vitus dance, so you can’t be vaccinated against it. 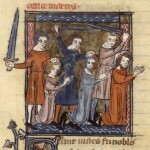 The martyrdom of Vitus, Modestus, and Crescentia, from a fourteenth century manuscript.